Welcome to the AmericInn Minocqua, Wisconsin the ideal location for your next stay, whether you are traveling for business or pleasure. We are proud to provide the amenities you want most and deliver them at the highest level possible starting with comfortable, quieter guestrooms. Our Minocqua hotel offers a variety of room types including suites with whirlpools. Wake up each morning to our free, hot, home style AmericInn Perk breakfast and stay connected with free, hotel wide, high speed internet. 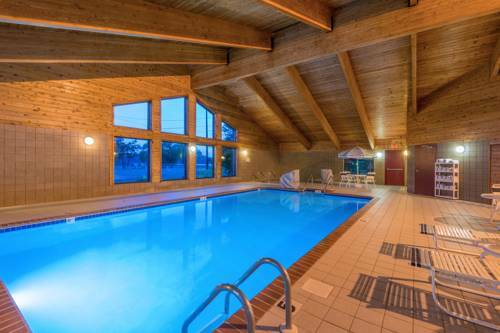 Guests also enjoy our inviting, indoor pool and hot tub. The AmericInn Minocqua hotel is conveniently located off Highway 51 in Minocqua, Wisconsin across from Lake Minocqua and Torpy Park. The AmericInn Minocqua hotels central location provides quick and easy access to all of Minocquas best area attractions, such as the Wildwood Wildlife Zoo. Minocqua is also known for its great fishing, water sports, skiing, and hiking opportunities. Visit our Minocqua WI hotel on your next family vacation and see what we have to offer. The AmericInn Minocqua hotel is conveniently located off Highway 51 in Minocqua, Wisconsin across from Lake Minocqua and Torpy Park. The AmericInn Minocqua hotels central location provides quick and easy access to all of Minocquas best area attractions, such as the Wildwood Wildlife Zoo. Minocqua is also known for its great fishing, water sports, skiing, and hiking opportunities. Visit our Minocqua WI hotel on your next family vacation and see what we have to offer. - Howard Young Health Ctr. Elusive vicious creature -- a lumber town makes hay with a beloved local monster. Donated to the town in 1925 by Sue Hammond Rae, and moved to his current Mall spot on August 3, 1983. Unusual in that his exposed skin has been given a golden wash, while the rest of the statue is a monotone gray.